If you're looking for a healthier alternative to your current sour cream vegetable dip, consider hummus. 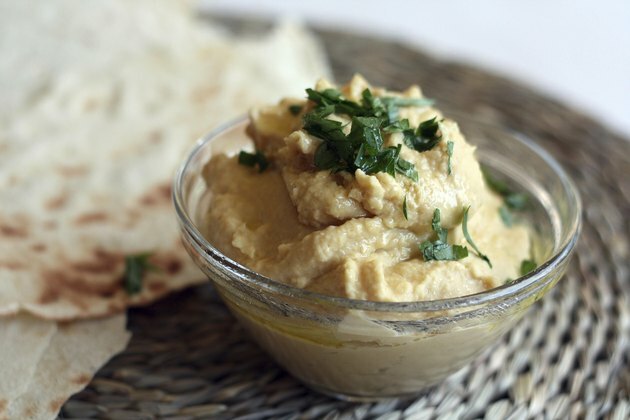 A middle-eastern favorite, hummus is a tangy blend of chickpeas, lemon juice, garlic, tahini and olive oil. Rich in protein, fiber and healthy fats, hummus makes your already healthy veggies even healthier. It also makes a delicious vegetarian sandwich or an alternative sandwich spread. Hummus, with 140 calories per 1/3-cup serving, is not a low-calorie food, but it is a nutrient-dense source of calories. Nutrient-dense foods are foods that contain nutrients you need for good health in a fairly small amount of calories. They are also natural foods that don't contain any added solid fats, sugar or refined starches. So while hummus is a little higher in calories than other healthy food options, you shouldn't feel guilty for including it in your diet because it is nutrient dense. Most of the calories in the hummus come from its carb content. A 1/3-cup serving of hummus contains 16 grams of carbohydrates. Carbs are essential for good health and provide your body with the energy it needs to function properly, as well as the energy you need to get through your day. Hummus is also a good source of fiber with 4 grams per 1/3-cup serving. Most Americans don't get enough fiber in their diet, according to the Academy of Nutrition and Dietetics, so adding a little hummus to your sandwich is an easy way to boost your intake. As a spread primarily made up of chickpeas, hummus is a good source of protein with 4 grams per 1/3-cup serving. Protein is found in every cell in your body, and the protein in foods like hummus is used to maintain and replace those proteins. While the hummus is a good source of protein, it is an incomplete source because it does not contain all the essential amino acids. But as long as you eat a variety of other foods throughout the day, such as lean meats, dairy, whole grains and vegetables, you should have no problem meeting your amino acid needs. Both the tahini, which is a sesame paste, and the olive oil provide fat in the hummus. A 1/3-cup serving contains 7 grams of total fat, but most of that fat is monounsaturated and polyunsaturated fats. The American Heart Association recommends most of the fat in your diet come from unsaturated fats like those found in tahini and olive oil. Getting more of these types of fat in your diet may help lower blood cholesterol levels when they replace saturated fats. Hummus provides a number of essential vitamins and minerals you need for good health, but are an especially good sources of folate and iron. Folate is a B vitamin that aids in the production of DNA and RNA, and is especially important during periods of rapid growth such as infancy and pregnancy. Iron is a mineral that helps make hemoglobin and assists with the delivery of oxygen throughout your body.